Cheerleading signs are a big part of any squad's duties during the buildup of spirit before a game. In the same way that people learn differently, some will respond to visual cues more readily than the chants and stunts of the squad. Well-crafted cheerleading signs reinforce that positive, energetic excitement for a school's team. Different types of signs have different purposes, and the messages put on them need to be focused on your own team, school and event. Cheerleading locker signs are fun; both to make and to share. When a player comes to his or her locker in the morning on the day of a game, finding some kind of good-luck encouragement waiting on the locker sets the tone for the entire day. It also serves to let the entire school know that there is a game. Usually cheer squads stay after school the day before a game to put up signs on the appropriate lockers. What to put on the signs is a matter of context. You can use a play on words, or write something that is applicable to the player. For example, a sign that says "Shoot for 3!" can be put on the locker of the best three point shooter on the basketball team. Even simple signs that say "Let's Go (team name) are effective at setting the mood for an upcoming game. Cheerleading spirit signs are the signs used in actual games either by the cheerleaders or in the stands by the fans themselves. Cheerleaders often start a game with a huge paper sign proclaiming some fierce slogan: "CRUSH THE WARRIORS!" that the team then crashes through as they're introduced. During the game, the fans can be led through cheerleading chants word by word with signs created on foamcore or posterboard. Foamcore is more durable, but also more expensive. One word or short phrases on each sign can help lead the crowd in various short chants during the game. It's a little chancy to let the audience bring in signs because you can't always keep objectionable phrases from creeping in. If you do let the audience bring signs, make sure there's a clear rule that inappropriate signs will be confiscated. There are also a few ways to involve the audience's own creativity with pep rally games. Iron Fan Competition - Similar to the "Iron Chef" TV show, this is a competition where groups of fans (for example, four from each class) are brought down either before a game or during halftime and given the same materials: crepe paper, markers, paint, etc. They are then given five minutes to create a spirit sign, encouraged by the fans (and usually with the announcer doing play-by-play). After five minutes, the best sign is judged by the audience, and the winning team gets a prize. 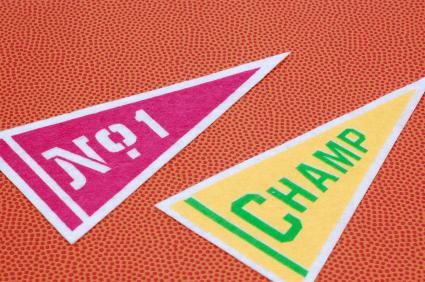 Class Competition - Tell the classes that there will be an Upper Classmen vs. Lower Classmen sign competition, and tell them to bring their creative signs up to be judged by the principal, cheer coach, or some other "neutral" official. Hidden Signs - It takes much more prep, but you can turn the entire bleacher section into a giant sign by hiding squares of construction or other colored paper underneath the seats and having the fans pull them out and hold them up at once. Photos of these kinds of huge signs become yearbook favorites and a part of the collective memory of the school. When used together, all these kinds of cheer signs become the landscape of your school's "Spirit Nation," reinforcing that unity of purpose to Go, Fight, Win!